With the great weather that Seattle had last week, many a weekend warrior dusted off their grills to put food to flame. I love summer because a great meal is as easy as opening up the backdoor, lighting a fire, and getting dinner (or lunch) rolling. Although I will say that I’ve grilled in the rain, cold and in pitch black conditions, but I’m okay with this. That’s why they make grill lights and fleece; to cook outdoors when the elements go bad. Or so I’ve heard. But as we get going with the long nights that summer offers, here are some great grilling books that I find myself turning towards of late. Tis the season for holiday shopping. Throughout the year, I’ve shared what I think has been interesting in the world of food. As the year closes and gift-giving is at the top of mind for most people, trying to find that perfect something for those near and dear to us can be challenging. Here are my suggestions on fun gifts for the food and wine aficionado on your list. Now let’s do our part to spur the economy! I think this thing is awesome. And only because of the candy apple red and glass bowl. As I’ve been delving into more and more baking (and wanting to make my own pasta), I’ve been yearning after a Kitchen-Aid for awhile. You will be mine, oh yes, you will be. Having a great chef’s knife is key to working in a kitchen. Bob Kramer is one of the very best knifemakers in the world. He’s partnered with Shun to make knives and I’m taken with the beauty of their cutlery. This one in particular fits the bill for what I want out of a knife. Another wishlist item that I’d be thrilled to slice and dice with. Now for a few more achievable gift items for those close to you; here are a few items worth looking into. Tomorrow is Thanksgiving. A holiday that is centered around food. And this is the reason why I feel that Thanksgiving is pretty awesome. It’s the start of the holiday season, you’re around friends and family, and you can stuff yourself silly with food; all together it’s a winning combination. But amongst the volume of eating you’ll find yourself with a mountain of leftovers. Unless you can go through a 14 lb turkey, several side dishes, and pumpkin pie, chances are you’ll need to find something to do with them. Have no fear, David Chang has ideas for Thanksgiving leftovers. And they sound amazing. David Chang is the brightest culinary star of the moment. An opinionated and supremely talented chef who has been a game changer in the restaurant world. His Momofuku restaurants are considered some of the best in New York and his style of food is utterly unique and blow-your-mind delicious. Recently, he and Peter Meehan released an amazing cookbook, Momofuku, that tells the story of Chef Chang and his restaurants. Needless to say, David Chang knows how to make enticingly tasty food. What’s really cool about some of these recipes is that they aren’t too ‘chefy,’ – recipes that are crazy complicated with obscure ingredients and technique most home cooks don’t have. Most of these recipes are straightforward and use the leftovers that stick around from Thanksgiving. I’m already looking forward to trying some of them. Enjoy this Thanksgiving! Take in the moment, exhale, eat up, and most of all have fun! In the world of cooking, I’m always amazed at the ability of the chef. The culinary artists that can take ingredients, technique, and personal style to create something amazing and delicious. Their ability to elevate the food they work with is a big reason why I love food so much. We live in a chef culture where television networks create stars out of these folks; they become a part of pop culture, not just food culture. In some cases this is a good thing. Food fans will travel far and wide to experience their cooking. They’ll devour their food and their cookbooks. All of this I think is very cool. That is why I am completely taken with this food book; Coco. If you love food and chef culture, you will too. The premise of the book is this; take 10 of the world’s true ‘masters’ in food, and have them pick 100 chefs that are emerging chefs worldwide. Coco: 10 World-Leading Maters choose 100 Contemporary Chefs comes to us from the folks at Phaidon. You may know them from their cookbooks like Silver Spoon, Pork & Sons, or 1080 Recipes, but their entire product line is excellent. I first discovered Coco on a recent trip to New York and stumbled upon Phaidon’s store in SoHo. This day happened to be their grand opening and much impulse shopping commenced. Coco was there and when I leafed through it, I instantly fell in love with the premise. The format of Coco is to spend some time with each of the 100 selected chefs. There is a brief bio, some recipes, and one of the masters will espouse on their choice. What’s interesting is to find the theme that binds the choices of the masters. I love learning about food and the people that make it, so I enjoyed the write-ups. For instance, you could delve into what Mario Batali values; a sense of niches, an appreciation of history, and high standards. What I like about Coco is that you can pick it up to leaf through a few pages at your leisure. It’s a weighty book that clocks in at over 400 pages (! ), but flip through it, open it up randomly and read about a chef you’ve never heard of before. It also has the ability to be a good resource; traveling to the Bay Area? There are about five chefs doing their thing there. New Orleans? Always a great eating city and they have two representatives. Locally, Seattle is proudly represented by Kevin Davis and his Steelhead Diner. I’m a fan of the place and so is Chef Batali. You’ll find all sorts of interesting chefs and restaurants around the world, so when globetrotting strikes your palate will be ready. One of the interesting tweaks about food lovers is that we acquire and accrue cookbooks voraciously. Chances are we never ‘read’ the entire thing. Most of the time they are used to impress our fellow food friends. But they always serve to inspire us. They give us ideas. Point us in a direction we may not have considered. And Coco is all of these things. When we went for our trip to Las Vegas this summer, we wanted to get away, but we also wanted to visit a particular restaurant; Rick Moonen’s RM Seafood. We wanted to go not just because it’s consistently recognized as being one of Las Vegas’ best restaurants, but also because of the principles and ideals it and its chef/owner Rick Moonen holds. Last year I had the good fortune to attend one of Amazon.com’s Fishbowl events. Fishbowls are small gatherings where visiting authors chat about their books and do a signing. The Fishbowl I went to welcomed Rick Moonen to celebrate his book, Fish Without A Doubt. As a food nerd, I enjoyed the event because Chef Moonen talked about his history as a chef, the opportunities and challenges with writing a book, and also his personal responsibility to be mindful of the ocean and the catch that comes from it. Coming from what the Seafood Choices Alliance named in 2006 as the ‘Seafood Champion‘, his words hold much weight. He was engaging in that tough, yet amicable New York way. His enthusiasm for cooking and sharing what he knows was apparent. We chatted briefly about seafood and where he planned on dining while in Seattle. He said that Steelhead Diner was on the docket and I mentioned how I was a fan. Armed with his business card, he said to stay in touch. Cool. Much like other food nerds, I love food (and wine) cookbooks. Much like how teenage girls gobble stuff up about vampires (Buffy is so much better), food geeks are voracious with food books. And why not? They provide solid insight, light the spark of inspiration, and provide a level of information and complexity that we love. Even the famed David Chang of Momofuku fame goes nuts over cookbooks. Whenever I visit bookstores, I always swing by the food section to see what’s new and soak in the visual merchandising. One book really caught my eye; Ferran Adria’s new book with Richard Hamilton and Vicent Tolodi, Food for Thought, Thought for Food. Adria’s new book? Heck yes. Ferran Adria is in the conversation of the best chefs in the world. His restaurant, El Bulli, is often considered the best restaurant in the world. Stepping into the lore and detail of these two things is something that I always find fascinating. I soaked up that TV show where Tony Bourdain was able to step into the kitchen of El Bulli. I looked forward to the release of A Day at El Bulli, the Phaidon book that illustrated the inner workings of Adria’s restaurant. Now I have another resource to pull back the curtain of Ferran Adria. While in Alaska last weekend, I wandered into the local’s bookstore of choice; Title Wave Books. I love stepping into bookstores and taking in the visual merchandising, the potential, and the dance of shopping. The clever ways that stores try to sell their stuff is something that I find entertaining (although a background in visual merchandising may have something to do with that). And like any good food nerd, I popped over to their food and wine section and was taken with one book in particular. Matt Skinner’s Heard it Through the Grapevine called out to me. I knew of Matt because he is Jamie Oliver‘s wine guy. Jamie’s cookbooks are often great, always fun, and I liked the little touches that Matt would have for wine pairings. When I saw this book at Title Wave, I was intrigued enough to pick it up. A make-or-break deal with any food reference cookbook is to have a proper balance of visuals and content. We’re no longer in a culture where a cookbook can skate by on copy; it’s unfortunate, but that’s the way it is. I’ve picked up and put down plenty of books that don’t have the initial grab and Matt’s Heard it Through the Grapevine definitely kept my interest. This is a pretty fun wine information book. Matt’s style of writing is very easy to digest and take in. This makes for a decent read where the information is balanced with the brevity. It’s broken down to five main sections; Shopping, Drinking, Eating, Sleeping, Well-being. I will say this though; this book is more of an intro to the world of wine. I knew most of what Matt mentioned, and it doesn’t exactly break any new ground. But the nature in how the information comes forth feels fresh. That is why I think this book is cool. One of the search terms that I get on this blog is ‘how to drink wine’. Kind of a funny term, but it makes sense. With the growth of wine drinking, the vast choices available to consumers, and the truckloads of information out there; a book like Matt’s will be helpful to wade through it all. 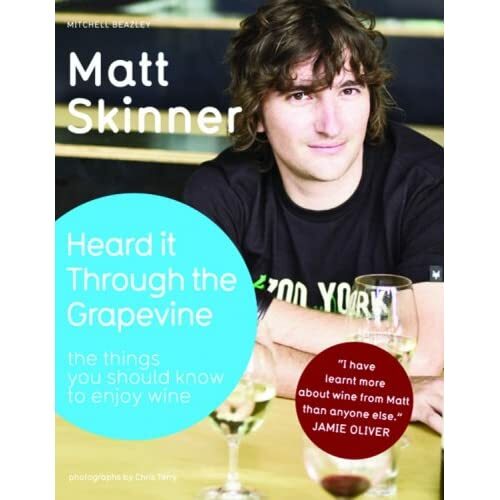 Heard it Through the Grapevine just came out this spring and would make for a fun book to give as a gift to a friend that wants to step into the world of wine.